The two Marine Corps veterans hadn’t seen each other since Afghanistan, and their reunion was mobbed by television cameras and reporters, so it was understandable if they seemed a little nervous. 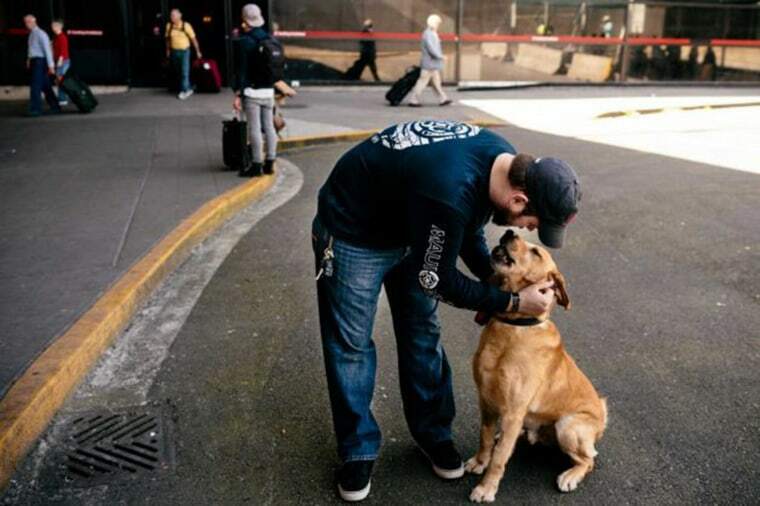 Deano Miller, on two legs, welcomed Thor, on four, to Seattle-Tacoma International Airport on Thursday. It was the culmination of a long effort by Miller to adopt the yellow Labrador, who had been his bomb-sniffing buddy during a 2010 tour of Afghanistan. But Miller’s tour ended and he eventually returned to civilian life in his native Tacoma, while Thor continued on with other Marine handlers. Thor left Afghanistan last fall and flew in Thursday from North Carolina, KOMO reported. The reunion was made possible by the American Humane Association and Mission K9 Rescue, which finds homes for retired military and police dogs. Thor will join a household that includes two other dogs and Miller’s fiancee, Tomi Gallegos.